We can never escape thinking about our generation. Even when we are children and don't grasp generational differences, we think that our parents don't understand us. As we age, we are always trapped between people who are older and younger than us and we can't help but compare ourselves to them, and those comparisons typically dwell on the differences. And when we look at those differences, we always think that our generation had it best/did it right, etc. While this kind of thinking has no doubt been around for centuries, today, I think a lot of it centers on technology. (I know that I constantly bore my kids with my tells of life before home video.) These kinds of ideas have been explored in movies before, but rarely as well as it in While We're Young. Josh (Ben Stiller) and Cornelia (Naomi Watts) are a happy couple. Josh is a documentary filmmaker who has spent the better part of a decade on his latest project. Cornelia sometimes works with her father, Leslie Breitbart (Charles Grodin), who is a famous documentarian. Josh also spends time teaching a film class, and one day he meets Jamie (Adam Driver) and Darby (Amanda Seyfried), a young couple. They all meet Cornelia for dinner and immediately hit it off. Jamie is interested in making a documentary and he can't stop asking Josh questions. Josh and Cornelia are fascinated by the younger couples energy and enthusiasm for life, and the quartet begins doing more and more things together, to the point that Josh and Cornelia stop seeing their old friends. As they get closer, Jamie begins to ask Josh for help on his own project. Josh is willing to help, but he starts to feel threatened by Jamie's drive and talent. Let's take an odd tactic and talk about two reasons why While We're Young should not work. First of all, this idea -- an older couple becomes friends with a younger couple and they begin to see the differences -- has been done before. Specifically, I was reminded of an episode of American Dad! entitled "Stanny-Boy and Frantastic" in which Stan and Francine nearly kill themselves attempting to keep up with a younger couple. (More on this idea in a moment.) The other reason is that I'm not a fan of Writer/Director Noah Baumbach. His previous movies The Squid and the Whale, Margot at the Wedding, and Greenberg ranged from unwatchable to really unwatchable. Therefore, I went into While We're Young with no expectations. Thus, I was very surprised by how much I enjoyed While We're Young. Let's go back to those earlier points. Again, the idea of couples from different generations getting together isn't new. And While We're Young does show Josh and Cornelia trying new things with Jamie and Darby, and either being exhausted or confused by them. But, we also see them being fascinated by their new friends, in both their views on life and their take on technology. (Jamie and Darby are decidedly lo-tech and lo-fi, which just blew my mind.) The movie quickly moves past the generational gap and becomes more about new friendships, trust, and jealousy. As far as Baumbach is concerned, I'm not sure what changed with him. The movie does have some of his common threads, such as New York City and hipsters, but it had a real energy that I didn't see in his earlier works. All of this would have been enough for me to sit up and notice the movie, but Baumbach has one more trick up his sleeve. The second half of the film dispenses with the generational gap and borders on becoming a paranoid thriller -- or at least taking on the characteristics of one. I don't want to give too much away, but the newfound friendship sours and true motivations and feelings are exposed. This part of the film actually carries a level of suspense, as it become a situation where a characters knows the truth and no one will believe them. 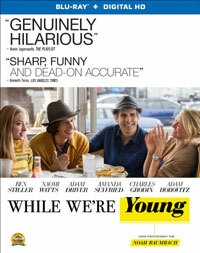 On top of this, While We're Young has a nice dose of humor. There is a laugh-out loud moment in the first act where Jamie describes his wedding with Darby. Who would have thought that Noah Baumbach would craft a character study/thriller/comedy? Not me. Not only does the movie has a surprisingly clever script, it is buoyed by great performances by the four leads. Yes, Stiller is playing his usual neurotic everyman, but it actually fits in here. Watts is great as his supportive, but strong wife. Driver continues to show that he may be the younger generation's master at delivering insanely weird lines in a believable manner, and Seyfried doesn't act as spacey as she has in recent films. The movie does drag in spots and Baumbach doesn't juggle the different tones perfectly, but While We're Young is still a satisfying film which touches on the ever-important generational gap and then goes from there. While We're Young made me question the technological decisions of the young people on Blu-ray Disc courtesy of Lionsgate. The film has been letterboxed at 1.78:1 and the Disc contains an AVC 1080p HD transfer which runs at an average of 29 Mbps. The image is sharp and clear, showing on a hint of grain and no defects from the source materials. The colors look good and the image is never overly dark or bright. The picture has a very nice level of detail and the depth is notable as well. The Disc carries a DTS-HD Master Audio 5.1 track which runs at 48 kHz and an average of 3.5 Mbps. The track provides clear dialogue and sound effects. Being a dramedy, we don't get a lot of dynamic effects here, but the street noise and the event during the finale provide pleasing stereo and surround effects which help to place us in the middle of the action. The While We're Young Blu-ray Disc contains several extras, all of which are quite brief. "The Cast" (2 minutes) has Baumbach describing the actors, which each of the primary cast members touch on their characters. "Director Noah Baumbach" (2 minutes) has the actors commenting on the filmmaker. Stiller and Baumbach comment on the veteran funnyman in "Charles Grodin" (1 minute). "Generation Tech" (2 minutes) explores how the characters use technology differently depending on their age. "Ayahuasca Ceremony" (1 minute) and "Hip Hop Dancing" (1 minute) allows the actors to comment on specific scenes.